It just wouldn’t be Christmas with out Gingerbread treats. I’ve made Gingerbread cookies many many times, but Gingerbread cupcakes have been on my to-do list for quite a while. I made these Gingerbread Cupcakes with Brown Sugar Cream Cheese Frosting for my booth at the PTA Holiday Bazaar and they were a top seller. The cupcakes smell fantastic and are extremely moist. I was on the fence with the Brown Sugar Cream Cheese Frosting; after taking a “poll” I decided to go with it. Boy am I glad I did, the brown sugar complimented the gingerbread perfectly. Since my biggest customers at the PTA Holiday Bazaar were kids I decided to make mini cupcakes. This recipe made approximately 60 mini cupcakes. If want to make mini cupcakes, simply reduce the baking time to 10- 12 minutes. 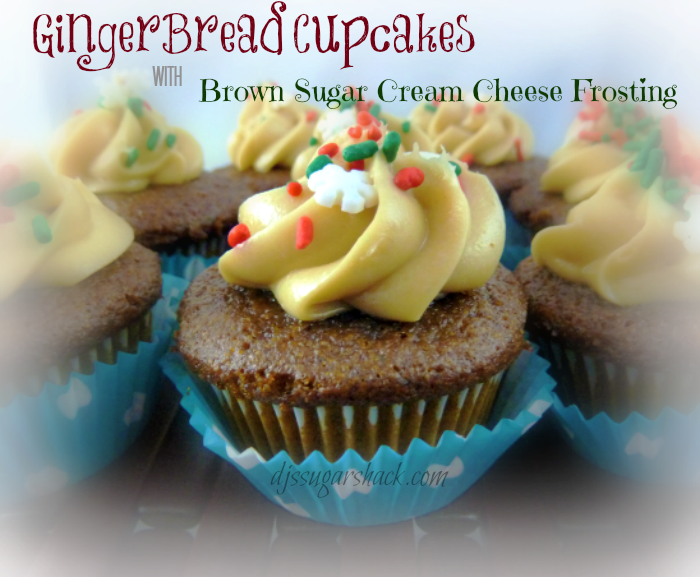 Moist and delicious Gingerbread Cupcakes topped with Brown Sugar Cream Cheese Frosting. Preheat oven to 350 degrees. Prepare pans with cupcake liners. Add baking soda to the boiling water and set aside. In a large bowl, sift together flour, ground ginger, cinnamon, ground clove, nutmeg, salt and baking powder. Set aside. In the bowl of a stand mixer, cream butter until light in color. Beat in brown sugar until fluffy. Scraping the sides of the bowl as needed, beat in molasses, fresh ginger, baking soda mixture & flour mixture until all ingredients are incorporated. Scoop batter into prepared cupcakes pans. Bake for 17 minutes or until a toothpick inserted in the center comes out clean. Let cool on wire rack before frosting. In the bowl of a stand mixer beat butter and cream cheese together. Add brown sugar and continue to beat until fluffy.